Talk about irony. Below is a scan of one of those classified ads run by the newspaper itself to fill in space and promote itself. This one comes from the May 7, 2015, edition of The Kansas City Star, although it has been running just like this, exactly as you see it below, for months. 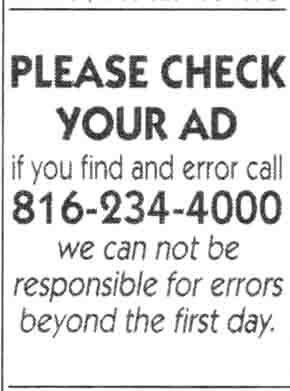 The very clearly stated purpose, first and in giant letters and in all caps, is to get advertisers to check their ads for errors, which is the first part of the irony because the second part is all the errors in this ad, written by newspaper employees and seen by so many people for so many months. The first letter of the word "if" should be capitalized because it's the beginning of a sentence. The phone number should be followed by a period because it's the end of a sentence. The first letter of the word "we" should be capitalized because it's the beginning of a sentence. "Cannot" is one word, not two. The four mistakes above are all straightforward errors in standard English that one learns by maybe fourth grade. Two more errors one doesn't expect from newspaper employees are not exactly deviations from standard English, but they are questionable. One is the choice of the ransom-note style of text treatment. In 22 words there are two fonts, three sizes, some bold, and some especially pointless italics. This is how some people who are brand new to computerly composition of text go about it. They realize to their delight that they have so many choices, and they mistakenly conclude somehow that it's better to use as many as possible for the same reason dogs lick their balls. More mature composers of text dial it back to the fewest changes necessary. Second, I disagree with the exact wording of the second sentence, which after corrections reads as follows: "We cannot be responsible for errors beyond the first day." Of course they can be responsible for such errors if they choose to. They mean to say they are not responsible, not that they cannot be. This remarkably dense collection of outright errors and questionable decisions in the wording of these few words is, unfortunately, representative of just how hard so many of the employees of The Kansas City Star try. The Kansas City Star is just generally an awful newspaper when it comes to customer service. The delivery department is ludicrously incompetent. The subscription department is staffed by comically incompetent people. And the people running the billing department of the Kansas City Star are even more incompetent, which it's hard to be. You can keep reading to learn about the incompetence of the Star's ombudsman, which you'll see is also ironic. On page A-3 of the February 10, 2012, edition of The Kansas City Star you ran a correction [saying the clues for 14-Across and 59-Across were switched] regarding the New York Times crossword puzzle that ran on February 9th. That correction is false, i.e., the two clues were not switched. Please run a correction, and thank you. Hello and thank you for writing. The New York Times itself issued the correction. The answer to 14 is "good one" and 59 is "Goodall," but those don't fit in the puzzle. They work if switched, as today's key indicates. Let me stop here to analyze Derek Donovan's several assertions of fact in his of February 10th. (1) Mr. Donovan says, "The New York Times itself issued the correction." He was very clear that the correction was from the NYT itself, not some third or fourth party. But this assertion is indisputably false. The NYT issued no such correction, for the simple reason that the puzzle as published by the NYT and sent on to the KC Star was without defect. Either Derek Donovan, Readers' representative, lied or he was mistaken. (2) Mr. Donovan says the answer to 14-Across is "good one," whereas it always was and always will be GOODALL. He was just plain wrong. (3) Mr. Donovan says the answer to 59-Across is "Goodall," whereas it always was and always will be GOODONE. He was just plain wrong. (4) Mr. Donovan says the answers to 14-Across and 59-Across as published by the NYT "don't fit in the puzzle." This assertion is indisputably false, as even the cursoriest of examinations will reveal. He was just plain wrong again. (5) Mr. Donovan says the answers I insisted on "work if switched." They do not work at all that way, unless you think the correct answer to the clue "Spirited" is NIVELY and not LIVELY. Here again, he is just plain wrong. And one is allowed to wonder why the correction corrected only one of the four pairs of theme answers. If this pair, GOODONE and GOODALL, is wrong then the other three pairs must be also. This contradiction should have thrown up at least three more red flags, but apparently they were a complexity no one at the Kansas City Star ever noticed. (6) Mr. Donovan claims to have access to "today's key," which can refer only the answer grid that is normally published with the next day's NYT crossword. He says it, "today's key," shows the answers I believe are wrong. No such key ever existed, which means Mr. Donovan lied or he was mistaken. That's a total of six assertions of fact and a total of 0% correct. I never called him a liar, but I did say this. This isn't exactly "DEWEY DEFEATS TRUMAN," but the correction is still incorrect. -- I sincerely doubt "The New York Times itself" issued any such correction. -- The answer to 14-Across is not GOOD ONE as you say; it is GOODALL. The answer to 59-Across is not GOODALL as you say; it is GOOD ONE. -- Those answers do not, as you say, "work if switched, as today's key indicates." If they did then the answer to 15-Down, for example, the clue for which is "Spirited," would be NIVELY when, of course, it is LIVELY. Also, what do you mean by "as today's key indicates"? If you have access to the answer grid for that puzzle, which I don't, and it shows GOODONE for 14-Across and GOODALL for 59-Across, I will eat Truman's hat. They got it wrong, and the correction was retracted in Saturday's paper. I don't appreciate your accusing me of lying one bit. Please do not write me back. As you can see, I never accused him of lying, and I still don't know that he ever did lie. I know he made six false assertions out of six, and I think it would take a lot of mistakes he should have caught for none of his assertions to be lies or at least cover-ups, but that's not the point. The point is that in mine of February 11th Mr. Donovan pretended to see an accusation of lying. He invented this accusation so he could take umbrage at it, which didn't fool me and probably didn't fool you either. It's a lame version of the straw-man argument. It's a shabby, devious attempt to draw our attention away from his six mistakes out of six, and it didn't work. In fact, it's kind of insulting he thought I would be fooled so easily. And then he went further and, like a child who can't face being caught, decided to run away from the problem by telling me not to write back. Do you think he told me not to write back because he thought I really would call him a liar or because I would point out again his many false statements? My guess is the latter. He was embarrassed to have been so completely wrong twice despite his having not one but two opportunities to get it right. He did not do as a mature adult would, which is to admit the mistakes, apologize for them, and thank me for trying to improve his newspaper. He could have responded in the light mood I tried to create in mine of February 11th, but he became truculent and said I hurt his feelings. If your feelings are hurt because someone justifiably accuses you of making six mistakes out of six, they deserve to be hurt. Well, anyway, none of the foregoing is all that interesting since it was strictly between Derek Donovan and me. But then something happened. As a member of Cruciverb.com, a forum for crossword puzzle constructors, I brought up this putative problem with a New York Times crossword. I was assured the NYT never issued any correction, and, of course, the answer grid the following day did show just what I said it would. As a member of Cruciverb.com one Victor Fleming got intrigued by Derek Donovan's evolving problems. By virtue of his being a long-time traffic court judge and a good and thoughtful writer (as well as a frequent constructor of NYT crosswords), Judge Fleming writes a column that's published in several newspaper outlets in the Little Rock area and surrounding states. It's called "I Swear," and here's the column that was published in March of 2012. It will be helpful as you read Fleming's column to know that the NYT puzzles that run on Thursdays are almost always the trickiest of the seven that run each week, and the puzzle in question was indeed a typical Thursday in that it was atypical. You'll see that we have Donovan blaming "several people" for an error in a correction that he himself wrote and had a second chance to get right. And you'll see that, of however many people who wrote Derek Donovan in response, he cherry-picked a reader who diminishes the whole kerfufflet by comparing it to climate change or war or malaria, as though its insignificance somehow makes the many mistakes less mistaken. 34A/21D Catchphrase that provides a hint to eight answers in this puzzle ALL FOR ONE, ONE FOR ALL. Johnny, who has a wry sense of humor, wrote back: “This isn’t DEWEY DEFEATS TRUMAN, but the correction is incorrect. I doubt the Times issued a correction. If you have an answer grid that shows GOOD ONE for 14-A and GOODALL for 59-A, I’ll eat Truman’s hat.” President Harry Truman, known for wearing Panama hats, was from the Kansas City area. “For the second time … in my days as readers’ representative, I’ve … written a correction to a previous correction. …” He [Donovan] notes and quotes the correction that concluded “the clues to 14 and 59 across were switched.” The reason for the correction, he writes, is that more than one person told him “the clues must have been switched” because 14A’s answer fit 59A’s clue and vice versa. Oh, how little some know of Thursday Times puzzles! “I checked with the syndicate who also looked into it,” he [Donovan] continues. “Verdict: Yes, there was an error. So the correction ran. Not so fast, said several crossworders today, proving that my mind simply doesn’t operate on the same level as theirs. I’ll let one of them explain it: [explanation, from someone other than Johnny, omitted]. I just have to say here that sometimes I get concerned when people compare the topic under discussion to the most extreme examples. Just because our world has more serious problems than a crossword correction doesn't mean the crossword correction is unworthy of discussion. If we were to follow the implied advice from Fleming's correspondent, we would never discuss any problems other than the world's most serious. Yes, she's right, but her implied advice is not.